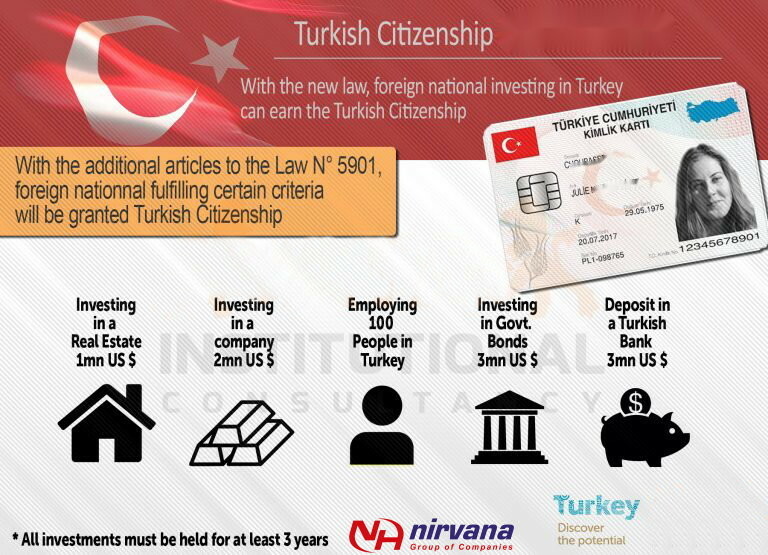 it is possible to obtain Turkish citizenship on exceptional basis for foreign nationality who purchased the property with a minimum value of 250,000 $ under the condition to keep it without selling for three years. The Spouse and children who are less than 18 years old will also be granted Turkish Citizenship. Your Turkish Citizenship will remain throughout your life and your children will be born as Turkish Citizens. You can keep multiple citizenships along with your Turkish Citizenship. · Proven by the Ministry of Industry and Technology to have made a minimum fixed capital investment of USD 500,000 or equivalent foreign currency or Turkish lira. · Proven by the Ministry of Environment and Urbanization to have acquired a real estate worth a minimum of USD 250,000 or equivalent foreign currency or Turkish lira with a title deed restriction on its resale for at least three years. · Proven by the Ministry of Family, Labor and Social Services to have created jobs for at least 50 people. · Proven by the Banking Regulation and Supervision Agency to have deposited at least USD 500,000 or equivalent foreign currency or Turkish lira in banks operating in Turkey with the condition of not to withdraw for at least three years. · Proven by the Ministry of Treasury and Finance to have bought at least USD 500,000 or equivalent foreign currency or Turkish lira worth of government bonds with the condition that they cannot be sold for at least three years. · Proven by the Capital Markets Board of Turkey to have bought at least USD 500,000 or equivalent foreign currency or Turkish lira worth of real estate investment fund share or venture capital investment fund share with the condition that they cannot be sold for at least three years.